We attended a special preview screening of SkyOne’s latest family comedy Yonderland. The series, created, written by and starring Mathew Baynton (The Wrong Man), Simon Farnaby, Martha Howe-Douglas, Jim Howick, Laurence Rickard and Ben Willbond first launched in November 2013 on Sky 1 HD. It returns to screens on 13th July 2015. SkyOne say “Head back to Yonderland this summer for an all-new outing of the critically adored, completely crackers, puppet-filled comedy from the team behind award-winning Horrible Histories. I was attracted at the idea of a stay at home mum having a secret life in another world. However, I was disappointed that her other life involved solving problems for other people. Isn’t that what us mums do all the time? If I get to another world, I want to splash around in a chocolate fountain and have people serving me! I did not find the show very funny either. I found the word play a bit too obvious for my liking and also did not like some of the more adult references with such young children in the audience. There were a few throwaway gags that made me smile but it certainly did not generate any belly laughs. Comedy is such an individual thing and this was just not for me. Having said that my husband and son thoroughly enjoyed the show. My husband could not understand why it did not amuse me and my son wants to watch it on television. I guess two out of three ain’t bad. In series two, settling into her role as Chosen One, Debbie of Maddox tackles tricky tasks for the Council of Elders, while fending off Negatus and Imperatrix’s attempts to get rid of her. Then there’s hubby Pete, who is growing increasingly suspicious about the blue sparks coming from the kitchen cupboard. Yonderland is produced by Working Title Television with puppets by Baker Coogan. I did enjoy the question and answer session with the writers after the screening. I wished they always answered the children’s questions honestly rather than trying to look for an easy joke opportunity. Fortunately they did answer my son’s question which was what genre of entertainment they would like to try next and what they would call the show. I was of course thrilled to hear someone say my son might have a future as the Head of Sky Comedy. Praise my child and I will forgive you a lot. So if I had to mark Yonderland out of ten from a family point of view it would get 6 out of ten. I completely forgot about wanting to sign up for this – drat! 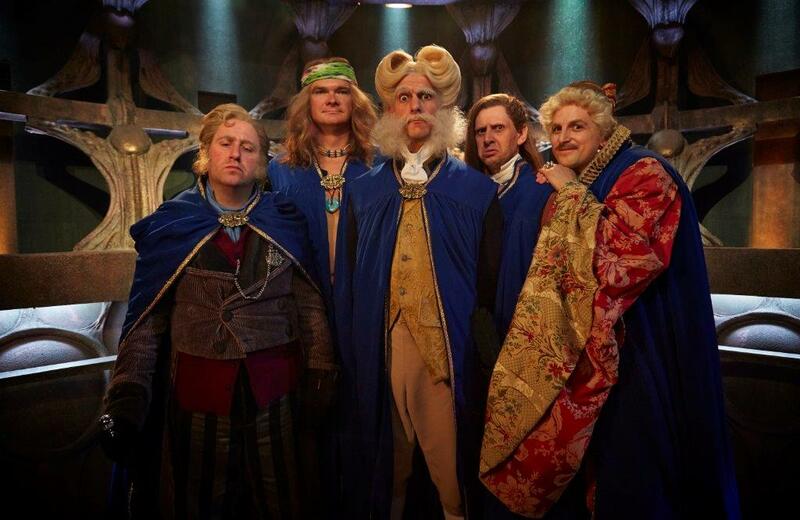 I really enjoyed the first series of Yonderland, but Hubbie didn’t, I guess comedy can be an individual thing. However we can both watch Blackadder forever. Glad 2/3 of you enjoyed it and well done to your son for getting his question answered and that comment.